Alita: Battle Angel is an ambitious project, one that’s been years in the making, but the end result falls short. It’s a middling sci-fi drama, fuelled by clunky exposition and special effects that might look cool now but won’t hold up. The film’s only saving grace is the actual angel leading the way. Alita waking up in her new body. This is a challenging role for Salazar (Bird Box, Maze Runner) – and not just because it’s motion-capture, although that is a huge factor. It’s admittedly hard, at first, to look into Alita’s oversized eyes and see her as anything other than a creepy trip into the Uncanny Valley. But Salazar makes it work, giving Alita a sweet likability that’s paired with raw temper and unfathomable power. Alita grows from a charming and innocent teenager into the strongest weapon known to humankind in the span of two hours, and Salazar brilliantly navigates the character’s emotional journey. Unfortunately, most of the movie fails to meet the standard that Salazar sets with her performance. Alita: Battle Angel is both too much and not enough, overstuffing the plot with needless exposition dumps while ignoring actual character development. If you’re only interested in the movie for the special effects, you’ll be...somewhat pleased? Some are jaw-dropping – especially the Motorball challenge, which is intense and gripping. But other parts feel tired, rehashed from better things, or doomed to irrelevancy the moment CGI technology surpasses it. The cyborgs, in particular, feel like digital dinosaurs-in-waiting. Their faces look plastered on, reminding me of the robots from A.I. : Artificial Intelligence, and I also failed to see an in-world explanation why the cyborgs always kept their human faces. In an effort to flesh out the world, including what felt like two main stories at once (having Alita join the hunter-warriors and become a Motorball player), too much of the movie is spent having characters over-explain things to people – mainly our protagonist. I get that Yukito Kishiro’s original Battle Angel Alita manga is complex, with a rich history that was explored over the course of several years, but the film should have been spent time exploring Alita’s life and world. Instead she ends up standing around like a polite idiot, forced to absorb piles of information that don’t really go anywhere. This reliance on exposition comes at the expense of actual character development, especially in Alita’s relationship with Ido. He is supposed to serve as Alita’s surrogate father – something the movie parallels with Ido’s backstory. Only, instead of giving the two of them moments to emotionally connect, Ido is mainly there to inform Alita of everything she needs to know for her next mission, while reminding her how she’s not supposed to do the thing she’s clearly going to do. The actor tries his best – there’s a moment with an orange that’s pretty cute – but he’s not given much to work with. Ido’s ex-wife Chiren (Jennifer Connelly) and her boss Vector (Mahershala Ali) fare even worse, shifting around like grains of sand wherever the plot needs them. It feels like a waste of two talented actors. However, the biggest waste of time is the love story. Yes, there’s a love story, and it’s dumb and pointless. 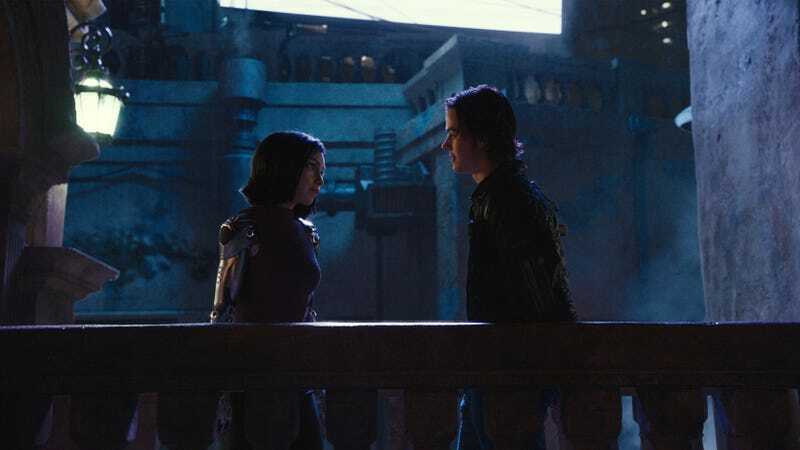 Right after waking up at the start of the movie in her new body, Alita has a meet-cute with Hugo (Keean Johnson), a scrap worker with a secret. Even though he starts out as her chummy buddy with a bit of sexual tension, the movie decides halfway through to make him the most important part of Alita’s life. She’s suddenly no longer tasked with finding her identity or growing as a person; instead, all of her attention is spent on helping this one boy achieve his dreams of making it to Zalem – even going to far as to risk her life for it. Salazar somehow manages to shine through this drudge of a storyline, but the whole thing feels tired and archaic. It might have had roots in the original manga, but here it comes across as a relic of Cameron’s older work, like Titanic and Avatar, stories that simply don’t play the same in 2019. As we saw with films like Spider-Man: Into the Spider-Verse, you don’t need a love story to give a female character motivation to do the right thing. It comes across as regressive and kind of sexist – especially when it’s at the expense of what should have been the emotional core between Alita and Ido. It also doesn’t help that Johnson is not the most capable actor, and his scenes with Salazar have the chemistry of two lab partners working on an experiment about a new type of construction paper. Alita has a better connection with the dog. The film does end on a bit of sequel bait (with a surprise cameo we won’t spoil), but at this point, I don’t really see the story continuing. If it does, I think future Alita movies would need new writers who focused more on her story, rather than over-explaining all of the manga’s nuances in between giant Motorball action sequences. Salazar’s Alita is the best thing here, and it’s too bad this movie didn’t do her justice.